Living in a studio apartment means finding creative ways of stretching the storage space and making sure certain rooms have some privacy, like the bedroom. You have to be careful when it comes to dressing up a tiny studio apartment because you don’t want the decors to overwhelm the space. De-cluttering and organizing may seem difficult at first simply because clutter seems to build up at a drop of a hat! If you are an avid collector but you are running out of space for your prized collections, why not put some on display? 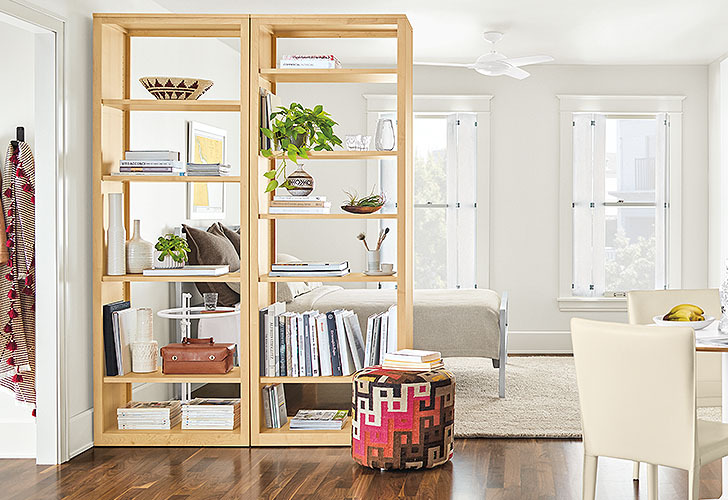 Putting personal collections on display is one way to add personality and style to any room. Just make sure to curate your collection so you don’t overwhelm your studio apartment. Putting whole collections on display will only eat up more room that would have been more useful as storage spaces. Organize books by size or color; use beautiful storage baskets to put your collection on display then finish up with a pretty rug to frame the arrangement or perhaps a couple of eye-catching decors. With a little thought behind the arrangement, even the messiest displays could become more beautiful. Did you know that a naturally bright room looks larger and airier than it really is because natural light makes any space appear spacious and light? It’s not enough to stretch your small apartment’s storage, the space should appear larger too! 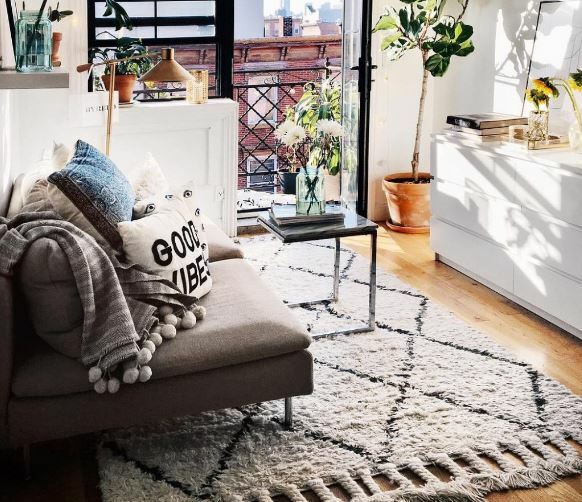 If your tiny studio apartment is getting a lot of natural light during the day, make the most out of the brightness by decorating the space with equally bright decors! 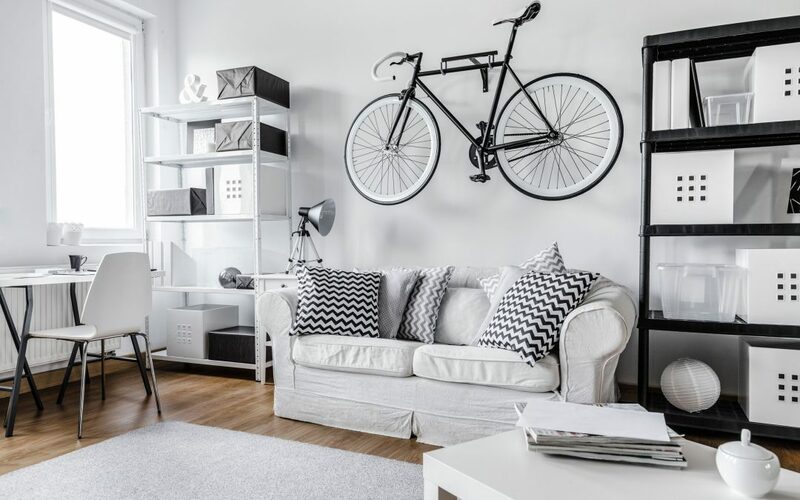 White decors, in particular, would look stunning in a small apartment. The bright and airy accents will complement the space, tricking the eye into seeing a much expansive space. You can also use bright dividers that let a lot of light in to split one large space into smaller private rooms. 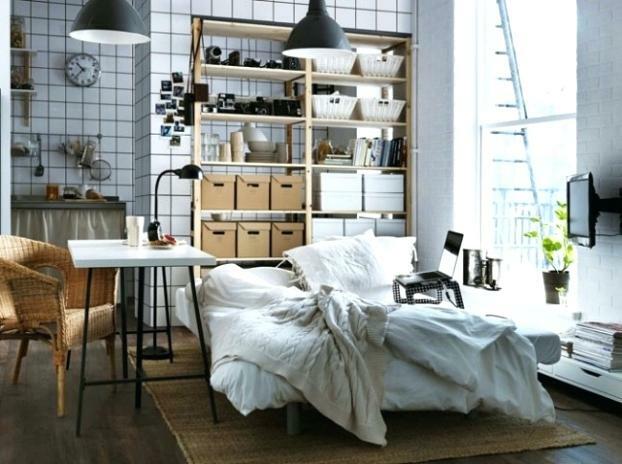 You can use shelves as a partition between the living and the bedroom, for instance. Just make sure the shelves are not blocking the daylight that naturally floods the space. You might think that a studio apartment offers little room for organization but you’d be surprised, there is always plenty of room to spare. All you have to do is to think outside the box! 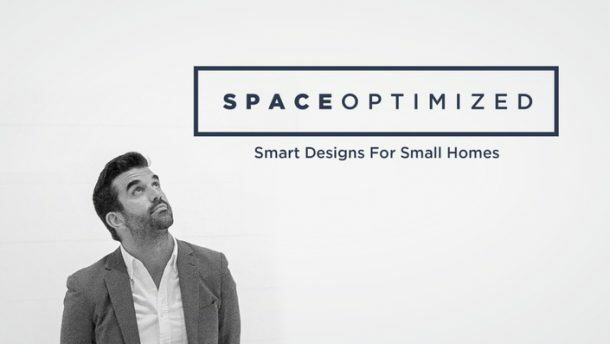 Instead of utilizing the horizontal spaces for storage, think vertically. 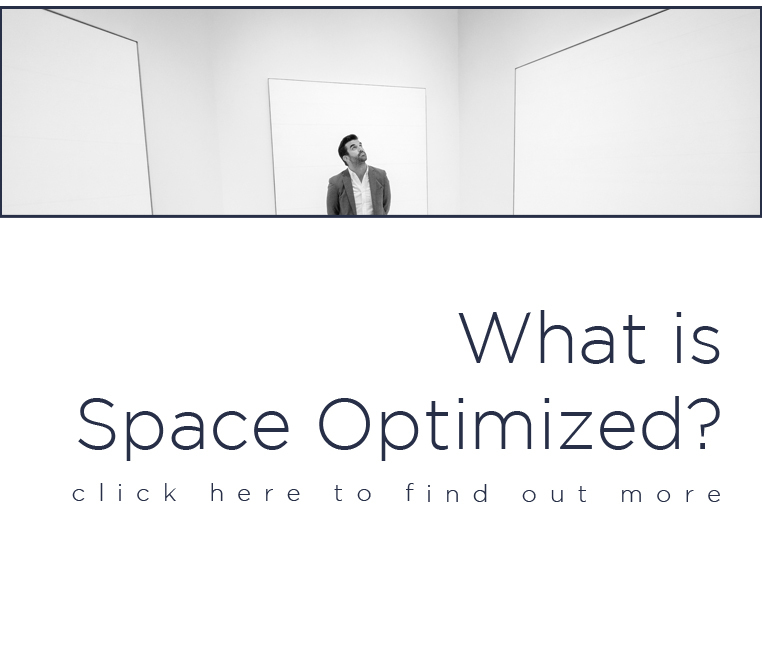 You’ll have infinite storage options by simply changing your perspective. Use floating shelves to make the most out of blank wall spaces. You can also invest in a storage system or furniture pieces that pull double duty as storage spaces too. Some furniture pieces can be customized to boost their storage and display abilities without compromising functionality. Don’t forget about mounting space organizers on any available wall space to stretch your storage space! You could also install bars or extra poles in the bathroom, kitchen, or dining room so you have more places to hang various objects. The thing with clutter is, it builds up no matter how carefully you try to keep your home spick and span. The only real way to keep clutter at bay is to continuously and tirelessly control clutter! Organize your home on a weekly basis, weeding out objects that are no longer useful in your home. If you can live without it, remove it so you can use the space for something better. Put everything back in order and never place an object in a place where it doesn’t belong so you won’t misplace it. High traffic areas of the home tend to be the most cluttered. You can keep clutter under control while also maintaining an organized space by installing organizational systems in places around the home that gets a lot of foot traffic! Something as simple as adding bins and baskets in the play area, living room, or bathroom, for example, will make a world of difference as far as organizing these rooms goes. If clutter tends to build up quickly, sort through your stuff and start recycling daily to keep your tiny studio apartment spick and span. Try this trick in the kitchen if it’s messy all the time. Essentially, you want to think of different ways to organize the room so your storage space will be used to its fullest. If your tiny studio apartment has a sliver of space for an entryway, use this space to its fullest potential to stretch what little storage space you have left. If your small apartment doesn’t have an entryway then go ahead and build one. The entryway is a useful space, it’s an efficient drop-off and pickup spot and every home should have one. This space doesn’t have to be decorated too heavily, just install a few essentials such as racks and hooks, open storage, a memo board, or a couple of cubbies so you have a place to store essentials that you can grab before heading out. Room dividers are such a godsend for people living in a studio apartment. These nifty pieces create a physical barrier, dividing a large expanse of space into different rooms with ease. The next time you shop around for room dividers; don’t just get the plain ones. Get a divider that comes with storage space, partitions with little pockets for small items. These dividers may be more expensive than plain ones but if storage space is an issue then it’s better to invest in these than getting pricey storage systems that take days to install!